In 1990 Nelson released their debut album After The Rain. They were an international MTV sensation, scoring the number one hit ‘Can’t Live Without Your Love & Affection’ and a string of other worthy singles. For many rock fans (though few would admit it) the melodic lead guitar work, slick arrangements and trademark harmony lead vocals were completely irresistible. For a lot of others, Nelson symbolised everything that was wrong with the crowded hair metal scene. Pointy guitars, white teeth and dry ice-filled music videos had all had their day and the tide was to turn quickly against anyone even half as groomed as a band like Nelson. Of all the acts who found themselves out of favour in the early 90s, Nelson were among those with real talent, and with the 1995 follow-up album Because They Can they approached a hostile audience with self-effacing humour (the sleeve featured two be-wigged dogs) and pragmatism (AOR gone, country-flavoured acoustic rock in its place). The songs, performances and production were all spotless and the material was much more consistent than the strong but filler-strewn debut. Despite this commendable effort to wrong-foot their detractors and prove their musical worth, the brothers just couldn’t win. The Nelson name was synonymous with their original pretty-boy image and the album tanked. 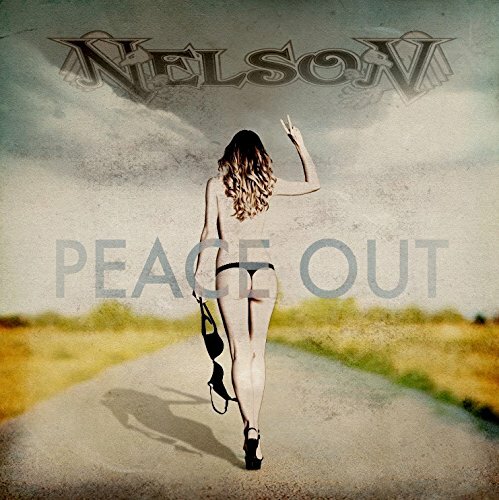 Fast forward to 2015 and here Nelson are with Peace Out, their second album of new material for Frontiers records, following up 2011’s well-received Lightning Strikes Twice. Like so many of the label’s ‘heritage’ acts, Nelson are sadly confined on both records by the need to pursue a classic AOR sound on the smallest budget possible. Marry this with heavy-handed, so-called ‘modern’ production and what you get is a high-octane, bombastic and cheap caricature of the After The Rain era sound. It’s easy to criticise this lowest-common denominator approach as cynical but I suppose it’s necessary for them to sell any records at all. Less forgivable is the album artwork. Oh dear. All that aside, Peace Out nevertheless has a great degree of charm to it and those hankering after big choruses, twin lead guitar work and the trademark Nelson harmony vocals will not be disappointed. Interestingly, the acoustic guitars that pervaded the debut have been dispensed with, giving the record a tougher sound in general. Silly opener ‘Hello Everybody’ does what it says on the tin and is either deep irony, or the band genuinely trying to introduce themselves to a new audience (good luck with that). In either case, it’s evident at least that they are having lots of fun from the outset. With their cheesy grins firmly in place, they follow up with the super-catchy anthem for nostalgia ‘Back In The Day’. It’s such a good example of what Nelson have always done well: perfectly pitched, infectious feel-good rock… my grin has also entered the building at this point. Chugging rockers ‘Invincible’ and ‘Let It Ride’ are both solid if unremarkable throwbacks to the golden age of hair-rock too, quite reminiscent of Firehouse at their peak. 'Rockstar’ is, in contrast, built on mighty slabs of heavy guitar chords - not a sound you’d expect from Nelson - but phew, it still has a big catchy chorus. Next comes the chunky riffage of ‘Autograph’ which can only be described as rock with very large cojones: metal, if you will. Thus a big shift is marked for the album’s second half. Both the gloves and the grins are now off; the guitars are turned up and tuned down: all together now, grrrr! It’s difficult for the album to recover from the shock of this unchartered Nelson territory, but the melodic, free-and-easy ‘What’s Not To Love’ just about re-establishes the smile and reminds us of the AOR brief. But they just can’t keep it up, so instead they go one louder again with the simply out-of control Zeppelin-tastic ‘You And Me’. Lots of people will appreciate this, but I can’t imagine onetime Nelson devotees are among them. With an intro borrowed from Metallica’s black album, ‘Bad For You’ is a similarly raucous affair, whose only saving grace is a cheeky reference to a Tommy Tutone song. Mercifully though, the album closer ‘Leave The Light On’ reins things back in again with its bluesy gospel swagger (think Poison circa Native Tongue) and the big Nelson vocals are back, along with more recognisable controlled guitar work. You’re safe to grin again. So yes, we’ve learnt that Nelson can still do Nelson. It’s fun, but it’s not a patch on 1990. We’ve also learnt that Nelson can rock out in a way that we never imagined, and clearly enjoy doing so. Good for them, I say. For the AOR nostalgia junkies, there is plenty to enjoy here. I, for one though, think the pair could have achieved so much more with a budget - and indeed for an audience - more worthy of their talents.